I only had the honor of competing against one world record holder in my career and I was blessed to watch what is arguably the highest score in the history of the Decathlon. 1963 was a long time ago and I remembered 9129 but it seems 9121 was the actual score. Below you will find some Internet references I found that substantiate my claim. The photo is the only one I could find but there is a very famous one taken in the 60 Olympics showing Yang Chuan-kwang trying to beat Rafer Johnson in the 1500. 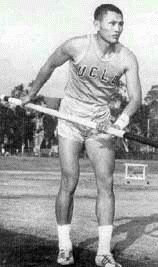 A minor point of interest Yang was the first decathlete to pole-vault 16 feet. The 1967 Encyclopedia Britannica Year Book (US Edition) has an extensive article on Yang. Using the 1985 tables Yang’s score is still over 8000! “As the year 2000 approaches, here's a look at some of the interesting anniversaries that will occur this week in Los Angeles sports history (followed by the ranking of the event from the book "Unforgettable: The 100 Greatest Moments in Los Angeles Sports History" in parenthesis, where applicable): Sept. 6, 1960: Former UCLA star Rafer Johnson defeats his best friend and former Bruins teammate Yang Chuan-kwang in the Olympic decathlon during the Roma Games. Yang, of Taiwan, won seven of the 10 events, but Johnson racked up an Olympic-record 8,392 points to win by 58 points. Johnson scored easy wins in the shot put, discus and javelin to make up for the other non-first-place finishes.” I believe he was on the cover of Sports Illustrated the last issue of December 1963.